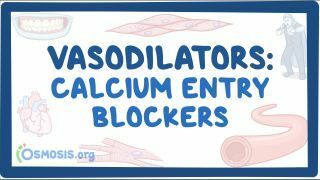 Osmosis: Vasodilators: Calcium entry blockers. (2019, April 20). Retrieved from (https://www.osmosis.org/learn/Vasodilators:_Calcium_entry_blockers). Nifedipine, sold under the brand names Adalat among others, is a medication used to manage angina, high blood pressure, Raynaud's phenomenon, and premature labor. It is one of the treatments of choice for Prinzmetal angina. It may be used to treat severe high blood pressure in pregnancy. Its use in preterm labor may allow more time for steroids to improve the baby's lungs and time to transfer the mother to a well qualified medical facility before delivery. Nifedipine is taken by mouth and comes in fast and slow release formulations. Amlodipine is a medication used to lower blood pressure and prevent chest pain. It belongs to a group of medications known as dihydropyridine-type calcium channel blockers. By widening of blood vessels it lowers blood pressure. In angina, amlodipine increases blood flow to the heart muscle to relieve pain due to angina. Nicardipine hydrochloride (Cardene) is a medication used to treat high blood pressure and angina. It belongs to the dihydropyridine class of calcium channel blockers. Nimodipine (marketed by Bayer as Nimotop) is a dihydropyridine calcium channel blocker originally developed for the treatment of high blood pressure. It is not frequently used for this indication, but has shown good results in preventing a major complication of subarachnoid hemorrhage (a form of cerebral hemorrhage) termed vasospasm; this is now the main use of nimodipine. are a class of Ca2+ channel blockers that preferentially exert their effects on vascular smooth muscle. A 65-year-old black man diagnosed with essential hypertension 4 weeks ago presents to his follow up appointment with bilateral, non-tender leg swelling for the past 2 weeks. The patient states he has never experienced this before, and is having a hard time putting on his shoes. The patient is otherwise healthy and complains of no other symptoms. Medication reconciliation is significant for an antihypertensive drug and daily multivitamins. Physical examination shows no signs of congestive heart failure, and edema is localized to the lower limbs only. Which of the following medications is the most likely cause of the patient's edema?